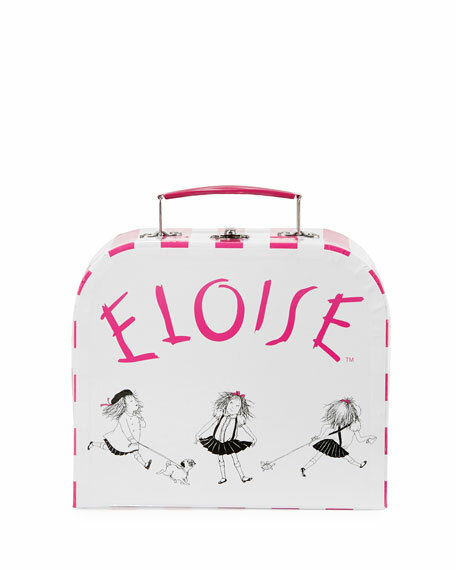 Scenes of Eloise's adventures and mischief come to life with illustrations of Eloise, Nanny, her dog Weenie, and pet turtle Skipperdee on plates and tray. All twelve pieces fit securely inside our sturdy take-along paperboard suitcase, allowing you to arrange "rawther" fabulous and impromptu tea parties anytime and anywhere! 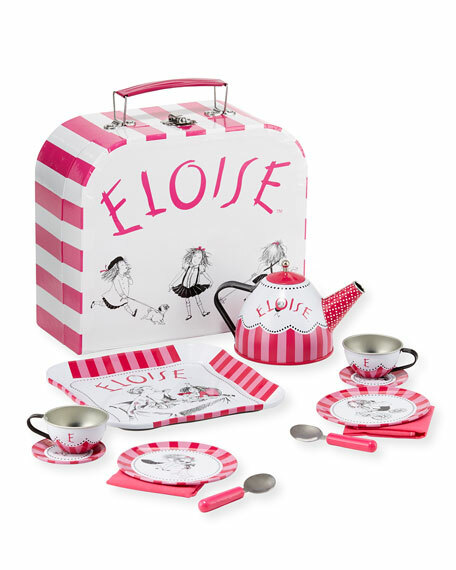 Inspired by the beloved Eloise book illustrations, our Eloise 12-piece Tin Tea Set caters to the rambunctious six-year-old within us all who dreams to live on the top floor at the Plaza Hotel. Includes: a tray, teapot with lid, two cups, two saucers, two plates, two spoons & two napkins. Takealong paperboard suitcase with illustrations; box size 8.5"W x 3.8"D x 7.9"T.